Records (Investigation 11-02-016). The ALJ’s decision found that PG&E (1) did not maintain records for its gas transmission pipeline in a manner that would allow safe operation of the company’s gas transmission system, and (2) violated the CPUC’s procedural rules by providing incorrect and misleading responses to the CPUC’s requests for information. Class Location (Investigation 11-11-009). The ALJ’s decision found that PG&E did not operate all pipeline segments of its gas transmission system in a manner that was consistent with class locations of the line segments, in particular segments in more densely populated areas. Construction, Operation and Maintenance (Investigation 12-01-007). The ALJ’s decision found that PG&E did not comply with industry consensus standards and federal and state requirements applicable to the construction, operation, and maintenance of the gas transmission line that ruptured. The decision also found that PG&E’s response to the San Bruno rupture did not comply with applicable regulations. Recommended Penalties. The ALJs issued a joint decision recommending that PG&E be assessed a total of $1.4 billion in penalties. The ALJ’s order recommended that PG&E pay $950 million to the State of California General Fund and reduce the company’s revenue requirement and refund to ratepayers $400 million in costs associated with the company’s Pipeline Modernization Program. Revised Gas Distribution Annual Report forms and instructions available. 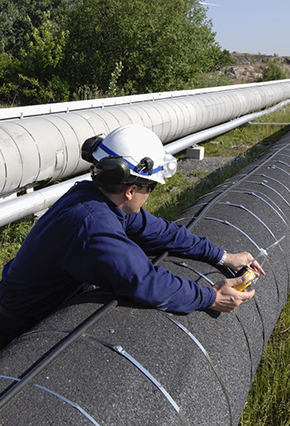 The Pipeline and Hazardous Materials Safety Administration (PHMSA) has posted the recently proposed revised the gas distribution annual report form (PHMSA F7100.1-1). Comments on the notice and revised forms are due September 15. Presentations from PHMSA’s August workshops are available. The presentations from PHMSA August 5 Managing Pipeline Crack Challenges Workshop and August 6-7 Government & Industry Research & Development Forum are now available. Updates on status of PHMSA Rulemakings. The table below reflects information on the status of PHMSA rulemakings as reported in the Department of Transportation’s (DOT) August Significant Rulemaking Report. Additional information from the OMB Office of Information and Regulatory Affairs (OIRA) is here. INGAA issues report regarding communications with emergency responders. In July, the Interstate Natural Gas Association of America (INGAA) issued a report entitled Current Practices for Communicating with Emergency Responders. The report is based on surveys of emergency responders and addresses the need for promoting and ensuring more communication and interaction with emergency response personnel. The report contains potential communications enhancements and recommended actions that pipeline operators and the industry could take to improve communication and coordination in an emergency. AB 1937 (Gordon) (now Chapter 287, Statutes of 2014): This bill amended the California Public Utilities Code to require gas corporations to provide at least three working days’ notice before undertaking any non-emergency excavation or construction activity within 500 feet of a school or hospital. The bill passed the Assembly by unanimous vote on May 23, and was referred to the Senate for consideration. The Senate amended the bill on June 11 to include a 5-year recordkeeping requirement and a provision requiring excavators or operators to comply with the state’s one-call notification requirements. On June 30, the Senate amended the bill to delete the provision regarding excavator or operator compliance with the one-call requirements. The bill, as amended, was approved by the Governor on August 25. SB 1389 (Hill): This bill would prohibit a gas corporation from using the “grandfather clause” in 49 C.F.R. Part 192 to determine the MAOP for an intrastate gas transmission line. The federal pipeline safety regulations currently allow operators to determine the MAOP for a gas pipeline by using the highest actual operating pressure that a segment experienced during the 5-year period preceding July 1, 1970. SB 1389 would prohibit the use of that provision and require operators of intrastate gas transmission lines to determine MAOP solely on the basis of the CPUC’s rules or orders. The bill unanimously passed the Standing Committee on Energy, Utilities and Communications on May 5 and was pending before the Senate Committee on Appropriations. The bill did not make it out of committee, as the Legislature has adjourned for the year. SB 1371 (Leno): As modified on August 22, this bill would require the CPUC to adopt rules and procedures, while giving priority to safety, reliability, and affordability of service, to minimize natural leaks from CPUC-regulated gas pipeline facilities, with the goal of reducing greenhouse gas emissions. The regulatory proceeding would commence by January 15, 2015, and the rules and procedures would be required to meet the following objectives: (a) provide for the maximum technologically feasible and cost-effective avoidance, reduction, and repair of leaks and leaking components within a reasonable time after discovery; (b) provide for the ranking or recorded leaks and leaking components by volume or energy content; (c) evaluate natural gas leakage abatement practices to determine effectiveness; and (d) establish and require the use of best practices for leak surveys, patrols, leak survey technology, leak prevention, and leak reduction. The Senate passed the bill in late May and referred it to the Assembly for consideration. The August 22 amendments would require the CPUC, as soon as practicable, to require gas corporations to file reports detailing their leak management practices, new methane leaks by grade, existing methane leaks, and a best estimate of gas loss due to such leaks. The bill, as amended, was passed by both the Assembly on August 26 and the Senate on August 27, and enrolled on August 29. It was sent to the Governor on September 4. *On August 21, 2014, the Kansas State Corporation Commission announced a public hearing on proposed amended regulations adopting the 2013 version of the federal gas safety standards set forth in 49 C.F.R. Part 192. In addition, the proposed amendments would remove the 5-day repair requirement for class 1 leaks; permit utility companies to supervise repairs of natural gas lines in residential areas by defining “yard line” to end at the outside wall of an individually metered residential premise; and simplify the fee collection schedule for safety inspections and supervision by removing outdated assessment information. Michigan Public Service Commission proposes to incorporate federal safety regulations. On July 17, the Michigan Public Service Commission convened a public hearing on a proposed amendment to its rules to adopt by reference the latest federal gas pipeline safety standards. The proposed rules would also adopt updated technical standards and clarify the requirements related to the disconnection or abandonment of indoor gas facilities. HB 5556 (Townsend): This bill would increase the administrative civil penalties that can be imposed for pipeline safety violations to $20,000 per day, per violation, not to exceed $800,000 for any related series of violations. It would also require any person who engages in the transportation of gas or who owns or operates pipeline facilities to annually communicate with county and municipal emergency coordinators to review the public education and awareness programs. The bill was introduced on May 8 and was referred to the House Committee on Energy and Technology. Proposed regulation incorporating federal requirements. Pursuant to a proposal by the Nebraska State Fire Marshal, Nebraska has updated its regulations to reflect the current federal pipeline safety standards and add requirements for a statewide One-Call Notification Center. The proposed revisions were approved by the Governor on July 28 and became effective August 2. HB 1376 (Hammon): The bill establishes a committee to study the safe delivery of oil and gas, including natural gas and propane, throughout the state. The committee must report its findings and any legislative recommendations by May 1, 2015. The bill also makes a technical correction regarding the submission of oil pipeline facility spill response plans. The bill was signed into law by the Governor on August 1. A2711 (Handlin): This bill proposes to create the New Jersey Taskforce on Underground Utility Lines for the purpose of studying issues related to placing overhead utilities underground. The bill was referred to the Assembly Committee on Telecommunications and Utilities. New Mexico Public Regulation Commission initiates rulemaking on excavation and One-Call Requirements. On July 9, the New Mexico Public Regulation Commission proposed to amend its rules for excavation damage prevention and One-Call programs. The proposed amendments would require the establishment of a “positive response registry system,” and update underground facility operators’ (UFO) response requirements to excavation locate requests to include a “positive response” even if the UFO determines it has no facilities within the proposed excavation limits. The proposed amendments would also make failure to provide positive responses, pre-mark the intended site, or report damage a “willful” violation. Initial comments were due August 15. Response comments are due by September 10, and a public hearing is scheduled for September 24. A 9336 (Rodriguez)/ S 7010 (Espaillat): These companion bills would require operators of gas distribution facilities to accelerate the repair or replacement of pipe segments that are leaking, are at “high risk of leaking,” or may no longer be fit for service due to inferior materials, poor construction methods, lack of maintenance, or age. The bills also would provide a cost recovery mechanism for the accelerated repair or replacement program. Both bills have been referred to the respective energy committees. S 7430A (Maziarz) / A 9772-A (Paulin): These bills would: (a) establish and implement a uniform system for classifying natural gas leaks; (b) require that each gas corporation annually report the location and classification of each reported leak, the date each such leak was classified, and the date each such leak is repaired; (c) require that such information be made available upon request to any municipal or state public safety official and to members of the legislature; and (d) require the investigation of the need for additional winter surveillance of cast iron or ductile iron pipelines and the effect of extended frost on such pipelines. The bills are currently in committee. Public Utilities Commission of Ohio amends Gas Pipeline Safety Requirements. On July 30, the Public Utilities Commission of Ohio (OPUC) issued a Finding and Order amending its intrastate gas pipeline safety regulations. The OPUC amendments (1) define leak detection equipment; (2) require evaluation of repaired or reclassified grade one leaks within 30 days; (3) increase the monetary threshold for submitting construction reports for additions to intrastate gas pipeline facilities; and (4) require distribution operators to incorporate new construction, including riser installation, into their operator qualification programs. HB 483 (Amstutz): As recently enacted, this bill allows the Ohio Public Utilities Commission to waive the pipe design requirements in Subpart C of 49 C.F.R. Part 192 for operators of “gas gathering pipelines” or “processing plant gas stub pipelines.” Note that an earlier version of the bill had proposed to increase the maximum civil penalties for pipeline safety violations to $200,000 per day, per violation, not to exceed $2,000,000 for any related series violations, but that this provision was removed prior to final passage. HB 1607 (Baker): The bill would amend Pennsylvania’s Underground Utility Line Protection Law (One-Call Law) and extend the sunset date of the Act through 2021. In general, the bill would transfer enforcement authority from the Department of Labor and Industry to the Pennsylvania Public Utility Commission; create a Damage Prevention Committee; place additional obligations on facility owners, excavators, and project owners; and create an administrative process for the determination of violations and the assessment of penalties. On June 27, the House passed the bill, and it has been referred to the Senate Consumer Protection and Professional Licensure Committee. SB1459: This bill would amend Pennsylvania’s Underground Utility Protection Law to require the use of steel products made in the United States for any “construction, reconstruction alteration, repair, improvement or maintenance of gathering lines.” The bill was referred to the Senate Consumer Protection and Professional Licensure Committee on July 31. SB1458: This bill would require the use of steel products made in the United States for “casings or other safety devices” used in drilling oil or gas wells. The bill would apply only to devices added on or after the effective date. The bill was referred to the Senate Environmental Resources and Energy Committee on July 31. Washington adopts civil penalty cap increase. Effective on October 4, the Washington Utilities and Transportation Commission (WUTC) will have the authority to impose increased civil penalties for violations of its intrastate gas pipeline safety regulations. As a result of an amendment adopted on September 3, the maximum penalty per violation will be increased from $100,000 to $200,000, and the maximum penalty for a related series of violations will be increased from $1,000,000 to $2,000,000. These penalty caps are consistent with the limitations in the federal Pipeline Safety Act. More information is here.